will have its 50-year reunion on Saturday, August 11, 2018, at the Elks Lodge 235, located at 3535 McKinley Avenue in South Bend. A cocktail hour will begin at 6 p.m, with a sit-down dinner at 7. A vegetarian option will be offered, but must be ordered in advance. Watch for a mailing in early 2018 with additional details. For information, or to update your contact information, contact Paul Piller at papiller@sbcglobal.net. Meanwhile, be sure to check out the Class Creator web site for our class. it can be accessed through the South Bend Alumni Association’s web site Click on the link for class reunions. The Riley High School Class of 1978 will host its 40-year reunion on Friday, August 3 at The Brick, 1145 Northside Blvd, South Bend, IN 46615. Doors open at 5:00 p.m., with dinner at 7:00 p.m. The reunion will feature the band, Soul Function, which will play from 8:30-11:30 p.m. The cost will be $25 per person. A mailing is being prepared with reunion details. 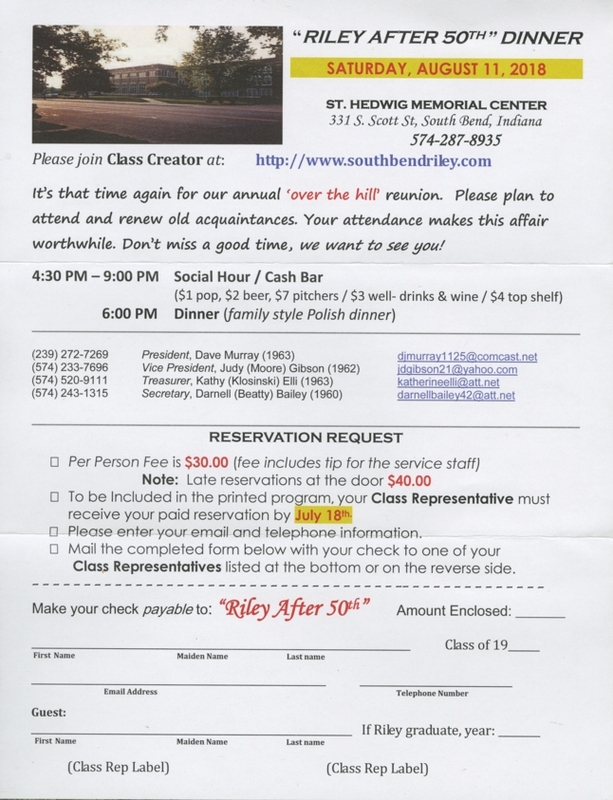 Riley's class of 1973 will be holding our 45th reunion over the weekend of July 20-21st. Friday night will be a BYOB event at Tim Andrews house, 1116 East Victoria, just blocks from the old school. The following night we'll dance and laugh the night away at Simeri's. All Riley mid 70's friends are welcome. If you need any more details or have any questions, email or call me at 574 220 7296.